Cutting and pasting is a common shortcut for people engaged in creating documents with Apple’s Pages or Microsoft’s Word word processing software. Command/control X and command/control V empower us typists to manipulate our words, sentences, and paragraphs quickly and easily into a new order, cleaner structure and greater clarity of expression. John Gall takes cutting and pasting back to the days before keyboards when cutting required a pair of scissors and pasting was what happened with a tube of glue, but he does so with dramatically different results. For the casual observer, a Gall collage is a very strange amalgamation of random cuttings haphazardly arranged. A full-color magazine cutout mouth and chin of a young woman is pasted upside-down above and on top of a fancy and full sorbet goblet with two ceramic plates as a base, turned and pasted 90 degrees clockwise. The plates and goblet are set in between two headless dark-suit-and-tied gentleman who are somewhat symmetrically placed in front of, or on top of, a sepia-toned photo of a grand oversized beautifully carved formal fireplace mantle, the focal point in a festive wood paneled room. The mouth, the goblet, the plates, the men, the fireplace are nestled in, anchored down, by a few other nondescript pasted cutouts; a Photoshop experiment run amok. What does it mean? Is there a common theme? Can any conclusions be drawn? Can it be categorized, compared, critiqued? Well, no, and deliberately so. The whole thing has an air of organic surreality to it. Something Salvador Dalí would read with delight and assured self-pronounced genius, a Lobster Telephone for the next generation. Or René Magritte would proclaim mysterious, puzzling, witty and brilliant, as classic as a train puffing out of a fireplace in his Time Transfixed. 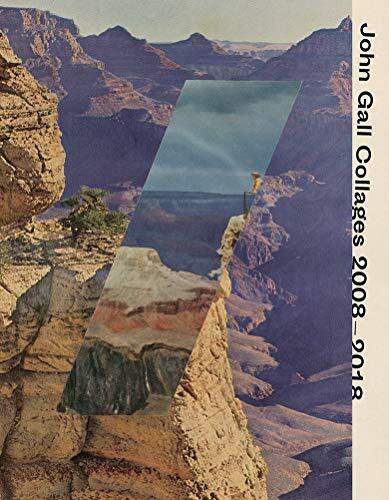 Not finding any relationships among the visual clues, nor titles to give away the smallest of hints, Gall’s collages will cause much shoulder shrugging, eye rolling, and brain scratching. And thank heavens for that. Far from making projects with refined compositions and stable structures, these cut and pasted projects deliver quite the opposite. They raise more questions than they answer. They trick the eye as much as trompe l’oeil. They blur the familiar into dizzying unorthodox territory. They beg for a blanked-out slate of art appreciation that has been connoisseured to death. They force a suspension of literal interpretation, to reset and cleanse the mind’s visual palate. Most likely they did the same for Gall. With very few words of explanation surrounding the collages, the reader knows only why Gall started this project and not much more. We are left to look at each page, imagine our own stories, laugh at our own jokes, and perhaps turn away from our control Xs and Vs long enough to pick up a musty magazine and a few faded photos and cut them up with reckless abandon. John Gall Collages will inspire anyone to rip and shred, cut and paste, and rearrange on a whim just because it is fun and weird, yet personally empowering and harmlessly chaotic, a benign way to reboot the brain, which seems to have worked well for Gall, who continues creating collages for the weekly The Shortlist section of the New York Times Book Review.